Once upon a time....a donkey thought he was very clever. Every day, his master harnessed him to a cart loaded with goods. They always went the same way to the village: along a wide path through the wood, down a gentle slope into farmland, than along the river to the ford and over the plain to the village. Since the route was always the same, the donkey's master had got into the habit of having a snooze on top of the cart, while the donkey, who knew the way by heart, plodded on. Feeling unwell one day, the man decided to risk sending the donkey by himself with a load for urgent delivery. When the animal returned, he was given a double ration of oats as reward. ''Since you're so clever at remembering the way,'' the man said, ''I'm going to send you alone always then I can do other jobs! 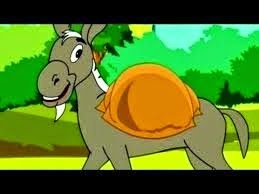 And from then on in all kinds of weather, the donkey traveled to the village by himself. His master was delighted. However, one morning, when the donkey reached the river, he decided to shorten his journey by wading across the water. But he entered the river at a deep spot, much deeper than the donkey expected, and he had to swim against the current. Luckily, he was carrying a load of salt that day and some of it dissolved in the water, easing the donkey's load, so that he reached the other side without much difficulty. I am clever,'' said the donkey pleased with himself. I've found a short cut.'' Next day the man loaded the cart with sponges and the donkey set off as usual. When he arrived at the river, he again thought he would take the short cut, and entered the water as he had done the day before. But this time, the sponges soaked up the water and made the cart heavy, so that the poor animal could not keep his head above water. And in spite of all his efforts the donkey that thought he was so clever sank below the surface of the water together with his load.